I was painfully unaware of this little gem of a baking phenomenon. Did you, like the rest of the humans, know about baking artisan bread in a Dutch oven? Or perhaps, were you like me and were slightly behind the baking times. Thank heavens my dear sweet Momma tipped me off. Our conversation started on the fact that we were both pining away for an enamel coated Dutch oven. I had been pining away forever because, well who doesn't want one. She brought up how badly she wanted one so that she could make "that fancy artisan bread". I picked my jaw up off the floor. I mean, really. How glorious must that be? Well, friends now I know. Angels singing in the heavens kind of glorious. New shoes kind of glorious. Kids all napping at the same time kind of glorious. Basically, it is warm, chewy, beautiful, white bread kind of glorious. There are several recipes out there. This is just my first attempt. I was drawn to this one because, unlike most of the Dutch oven artisan bread recipes out there, it could be started and finished in an afternoon. Most of the recipes call for making an easy dough at night but then letting it rest over night before cooking (basically the dough has to rise for 8 hrs). "ain't nobody got no time for that"
I am sure the time difference offers some benefit, but this much faster bread was pretty stinkin' good. Loaf was gone after one meal and an early snack the next day. We paired it with a yummy yummy soup I will be sharing this week for Slow Cooker Saturday. This bread is the perfect addition to...okay well any meal really. I mean who doesn't like bread? Not this girl and I have the fanny to prove it. If you have a Dutch oven, you can let the artisan bread baker inside of you out. There will be no turning back. I am already planning on making this again AND trying some new versions. Proof yeast by combining the yeast and the sugar in the bottom of the bowl of a stand mixer and then pour the warm water over it. Whisk it by hand lightly. Let is rest for 10 minutes until it is foamy. In a separate bowl mix 3 cups of the flour with the salt. Add the flour mixture one cup at a time to the yeast mixture in the stand mixer attached with the dough hook. The dough will start to come together, but still be sticky. Add in the rest of the flour in 1/2 cup increments until the dough completely comes together in a ball. Let the mixer knead the dough for a few minutes. Then dump the dough onto the counter and continue to knead for about five minutes, or until the dough is smooth. Place the dough in a greased bowl and cover the top with a lightly damp kitchen towel. Let is rise for 20-30 minutes. Preheat the oven to 400 degrees with the Dutch oven inside. Do not punch down the dough. Simply take out the ball of dough, that should have risen. Lightly coat both the bottom and the top of the loaf with flour. Carefully remove the Dutch oven from the oven and just as carefully drop the dough in the center of the Dutch oven. Cut three slits in the top of the loaf. That will give it that artisan top. Cook for 30 minutes covered. Then take off the lid and cook for another 7-10 minutes, until the top is golden and crunchy looking. Remove from the Dutch oven onto a cutting board. Let it cool slightly. Then slice into its artisan bread glory. I always appreciate anytime you pin or facebook a post from this blog. So feel free to make my day and share away. I am so going to make this! My husband will love it. I made fresh bread last week and he keeps sneaking to the kitchen to get some. It's good for our wallets too. Bread is so expensive in Hawaii. Just wanted to thank you, and I got the reference. I am on my way to get a "cold pop." Made this today and it is a bit salty. Should I have used kosher salt instead of table salt? Everything else was perfect and I am so excited to have found a recipe that can be baked the same day! Thank you! This was absolutely fabulous, and I don't know that I will ever again do the double-rise-oops-I-forgot-about-it bread... ;) YUMMY! Thank you, thank you. aint nobody got time fer dat! hahaa!! love it...and the look of that bread! I made it yesterday. I thought I ruined it when I transferred the loaf to the dutch oven because it squished down. I was pleasantly surprised when it came out of the oven-- round and beautiful. Is having the dutch oven hot when putting loaf in crucial? Would be easier if I could let it rise in the dutch oven. I am trying this today. We will see. Please let me know what the "Hot" dutch oven does for the loaf. Okay on my second try I went ahead and let the dough rise in the dutch oven and then put it right into the oven. Turned out beautiful just like the loaf yesterday. Makes it easier. Adam, that is good to know! Thanks for sharing. So question, I have a Cuisinart cast iron pot and my manual says that the pot can be heated to 500 degrees but the lid only to 350. You think that's with the nob? Would it be smart to remove it altogether? I really want to try this recipe but I don't want to mess up my pot! I should have read the comments before I made the bread. Although I loved the bread and it was quick to make, it was definitely too salty. I'll cut that down next time. I made this exactly as your recipe stated and it was amazing! My family all loved it and it was so beyond easy! A new staple! Thanks so much! 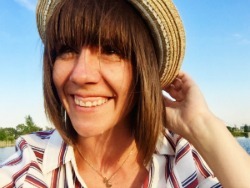 I'm going to blog about it now! What color/brand of dutch oven is that, do you mind sharing? The color especially I'm curious about. thanks! It is a Food Network Dutch Enamel Pot from Kohls. I can't find the color anymore, and I have forgotten what the color name is. SORRY. I made this bread for my family. Not only was it beautiful, but delicious as well. Four stars! I just made the bread and it looks wonderful. I cannot wait to taste it. Thanks for the post. I am definitely going to do this again. I just finished baking the bread and am looking forward to tasting it. 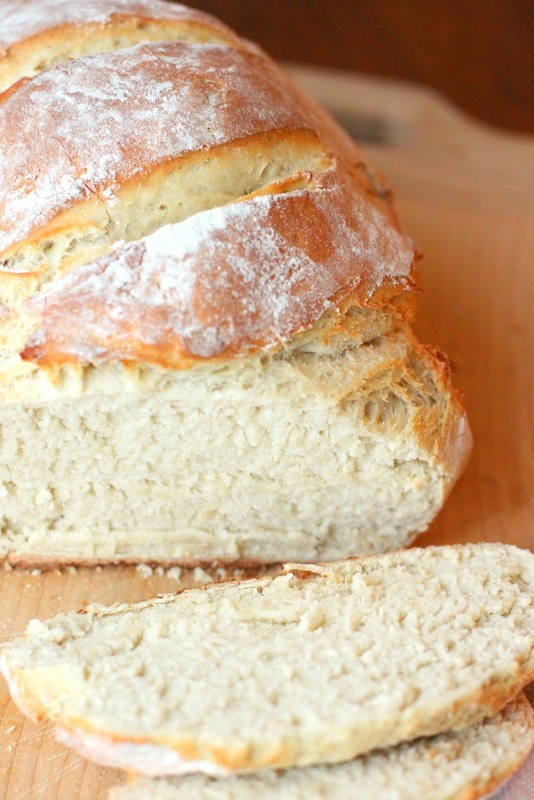 Do you have to use bread flour or will plain flour work? You can cover with Tin FoilFoil if needed. I Have an oval cast iron pot. would it make a difference? Should i increase the size of the dough? What size Dutch oven? Mine is kind of a smaller version than some, only 3.5 quarts. Will that be large enough?? 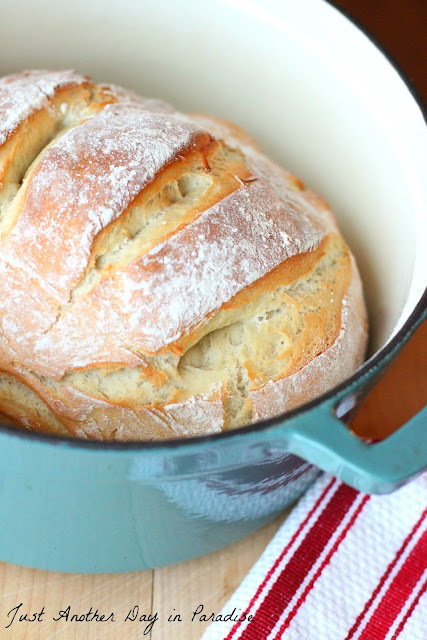 Is a 3.5 quart enamel pot large enough to make a loaf? Just curious if this was cooked in a convection oven or electirc/gas? I assume if not in a convection oven then I would simply and slightly change the temp and time? What size Dutch oven do you need to use? will it make any difference if I use all purpose flour instead of bread flour? I made this today and it turned out amazing. Thank you! I have to agree with it being salty. I will decrease the salt next time as well as adjust the yeast and sugar to compensate. I also will bake at 450 next time. I found it not quite cooked at 30 minutes. Good recipe though! It was totally stuck to the bottom of my dutch oven! Any suggestions for next time??? Just found this recipe on Pinterest. Please help - the Dutch Oven pot - must this be a cast iron enamel coated pot, or can I use a stainless steel Cuisinart pot? Appreciate the help. Bread looks amazing & all the positive feedback is terrific. Can you bake this in a non-enamel coated dutch oven? I am sorry I have missed so many questions about this bread. I will answer what I can. The Dutch Oven pot really should be an enamel coated pot. If you have a really well seasoned cast iron Dutch Oven it might work, but I have never tried it. I bake my bread in a traditional oven, not on convection. 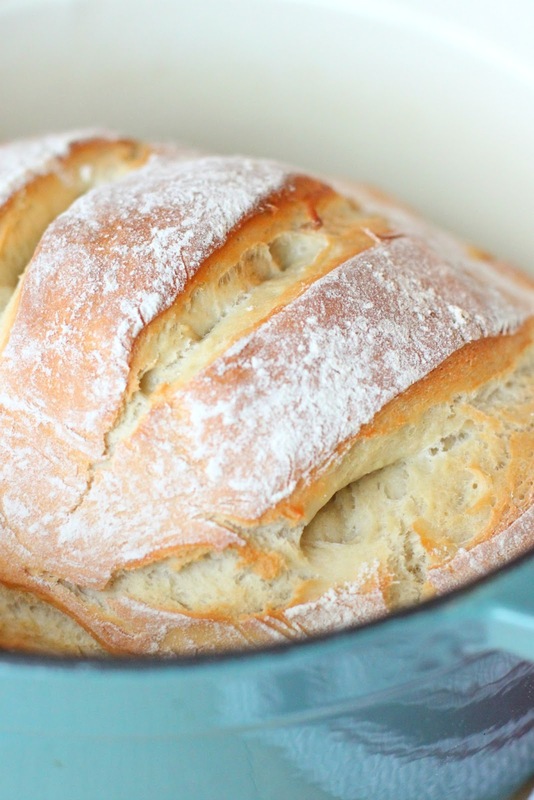 A small dutch oven would crowd the dough, but you could try it. Plain flour will work, but it might be less chewy because the gluten level is different. My pot is from Kohls and is a Food Network one. I can't remember the name of the color. Sorry. Whew, hopefully this answers any previous or future questions. I made this today. I halfed this recipe because I didn't have enough yeast and my bread came out great!!! Yum!!! Thank you!!! My new go to bread recipe!! I made this bread this morning. I halved the recipe because I didn't have enough yeast (and used all-purpose flour) and it came out GREAT!!! This is my new go to bread recipe!!! Thank you!!! The bread turned out great usung the bread machine and clay baking bowl. Thank you for the recipe! I made this bread yesterday. It was great. I used a 12 inch regular (not enamel) Dutch oven. It worked perfectly. I simply sprayed it with oil before place the bread in. I used all purpose flour. I decreased the salt to a little less than 1 Tbsp. I see many loaves of this in our future. This must mean 1 1/2 teaspoons of salt.. not tablespoons, right?!? I really appreciated all the comments and feedback. I started out following the directions to a tee. Since I live in South Florida, I did have to make some adjustments. I ended up having to add at least a cup more of flour due to the humidity and elevations. Next time I would try cutting back to 1 3/4 cup of water and leaving the flour at 3 cups. Still cooling so haven't tasted it yet but the dough did seem a bit salty. Thanks for the recipe, so easy and quick. You don't need an expensive dutch oven. I had the same issue someone else mentioned - my dutch oven was good to 500F, but the lid only to 350F. Instead I just use and old roasting pan with a lid. You know, the oval one your parents used for roasting just about everything. They're cheap, about $20CDN on Amazon (probably cheaper in WalMart), and work perfectly. I also let my dough rise on a parchment sling. When the pan and oven are ready I can grab the ends of the parchment and transfer the dough to the hot pan. Once it's cooked, I can use the parchment to safely remove the loaf. I've made this bread many times and we LOVE it! 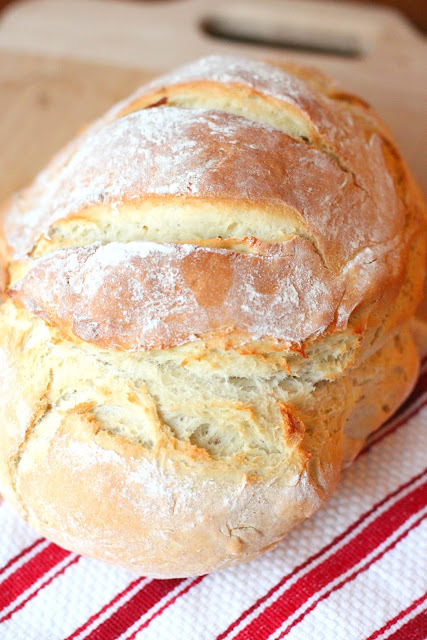 It's so easy to make, and doesn't take all day to end up with a terrific loaf of bread. It is a dense and crusty bread and that is how we like our bread to be. The only comment I would have is that I always use less salt than the recipe calls for - 1.5 Tablespoons. It was way too salty. I use 1.5 teaspoon salt and it's just right. Thanks for such a great recipe!!! Can cheese be added to this recipe?